The updated versions of the Rome Walkabout apps are available in the Apple Store and Google Play. The designs are improved, file sizes a little smaller, shorter articles and some updated content. So, if you are going to Rome or know anyone going to Rome, buy the apps. Tour Rome with Mary Redekop as your tour guide! Mary and the apps provide 1600 years of art and architecture in two days! Use them to plan your trip ahead of time, during your time in Rome and when you get home and want to remember what you saw. And the big change is that both apps are available in the Google Play store now. The Heart of London app has just received it's second award. The 2017 London Heritage award was presented by the ACO - London Region and the Heritage London Foundation on February 16th, 2017. The Heart of London app, which runs on Android and iOS tablets and smartphones provides a multimedia tour of the Forks of the Thames River in London, Ontario. ​The app is available in the Apple Store as well as the Google Play store. I just finished my third painting, La vista di David shown above. If you have visited Florence, Italy, crossed the river and climbed the steps, you will recognize this view from Piazzale Michelangelo. It took 163 hours to complete the work. It is oil on birch, 10 by 30 inches. Each front row building averaged two to three hours to complete. The church took about 22 hours. It was fun painting this, and less stressful than the one below, as I was not painting for someone; it's just for me. Sometimes, at the end of the day, I felt that I had painted for hours and gotten nowhere. Other times, painting a series of buildings made me feel that even though I still had hours of time ahead of me to finish, I was moving along just fine. Click here to see progression photos. I am so happy that I am finished! "Oh Look a Castle" painting wass a gift for my god-daughter, Brittany. It depicts a palace in Mantua Italy, the colosseum in Rome and Britt's favourite building (from the outside) the Duomo in Oriveto. Britt and I travelled for one month to all corners of Italy and like to reminisce about the trip. This painting will help us do that! More photos may be seen on this page. ​ ~ but are they? ​Adventures at Lorne Avenue School, Sir Adam Beck, and in the neighbourhood, pack life full of surprises for the Rogers family as Deb grows up East of Adelaide in London, Canada. ​ ~ but they are! Life was full of wild times as Deb grew up East of Adelaide from 1955 to 1974. The book covers neighbourhood and school stories from EOA, Lorne Avenue School and Beck Collegiate. There are humourous stories and some not so humourous. The focus is completely from Deb's perspective - because isn't life all about Deb? ​Click here to read the reviews. Click here to read James Reaney's LFP Article. Hey Wendy Watch This! is available for purchase at: Oxford Book Shop, Brown & Dickson and Attic Books. ​Copies may also be purchased directly from me with the links below. Read it on your iPad - iBook available here. 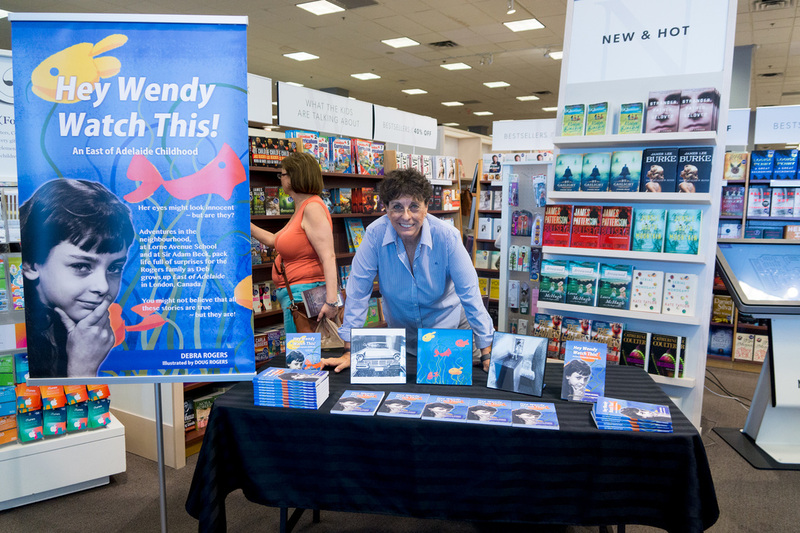 Photo above: Book Signing and Meet the Author at Indigo Chapters Masonville! 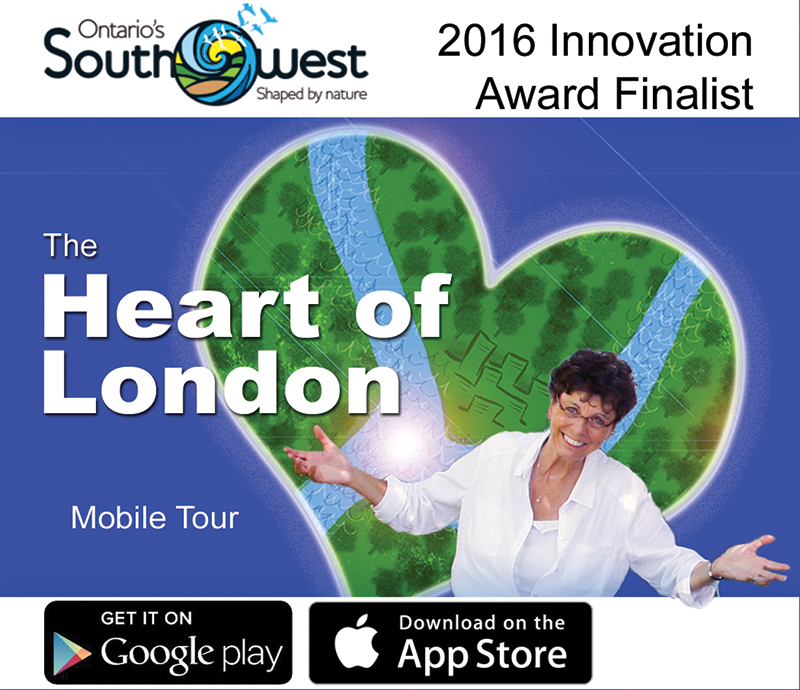 We are so excited and delighted to announce that the Heart of London app was recognised for the first ever Ontario’s Southwest Innovation Award for planning and implementing a new, innovative tourism product. The Heart of London addresses the need for content to be provided to mobile users where they want it and when they want it, while drawing them into downtown London; the Heart of London. By combining storytelling, compelling graphics and video with historical research, scenic localities and place markers, London history becomes accessible to both visitors and Londoners. Every attempt was made to open up the people and places of the past by using current, mobile technology. History and stories from London's past are presented in this slick, innovative and easy to use app. To attract tourists and locals to downtown London, specifically, the Forks of the Thames River, while encouraging exploration of the history and features of the area by providing a relaxed and informative mobile tour. To inspire healthy participation through walking or riding while at the same time providing a wheelchair accessible activity. The app is a fun and informative historical tour of London Ontario, with videos included which provide over ninety minutes of information. Teachers: The Heart of London app fits within the Provincial curriculum for Grade Six Social Studies; Strand A: Heritage and Identity: Communities in Canada, Past and Present. This link will take you to the Apple iOS version available in the Apple Store! This link will take you to Google Play. Two Rome Walkabout Apps are available in the App and Google Play Stores! The Mostly Roman & Early Christian and the Renaissance, Mannerist & Baroque apps have sold in 44 countries around the world with 600 downloads. ​People are already touring Rome using this app. Search for: Rome Walkabout, Redekop, Huiberts, or Walkabout. The apps sell for $1.39 (Canadian) each. 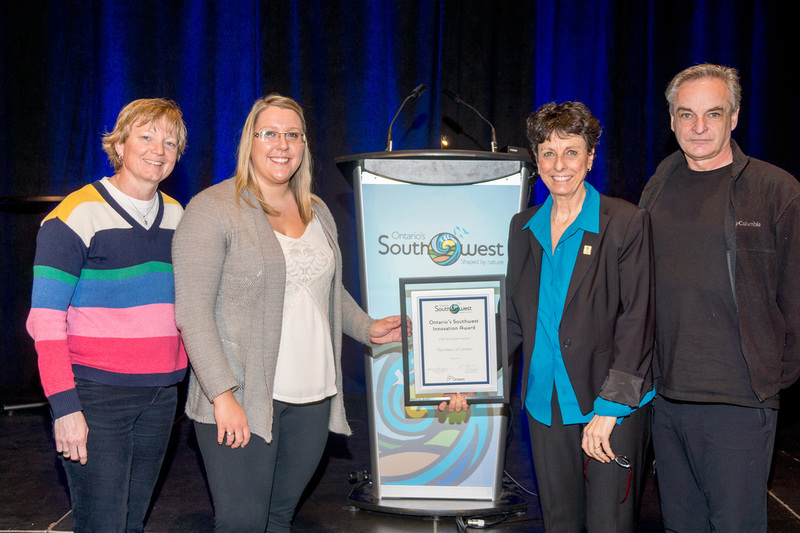 Each app provides maps, readable content, videos, photos, slide presentations and great walking directions. They are fun, informative and helpful. Maximize your time in Rome by using these apps. Click here to watch videos about how it works. Live Walking Tours Available for Individuals or Groups. Deb is a creative technology teacher and developer who lives somewhere between the Flintstones and the Jetsons. Her love of ancient civilizations and London Ontario history is currently her focus as she develops apps for mobile devices about these topics. The Heart of London has been released and more apps featuring local stories and history are in the works. Mindful adult educator educating adults mindfully! My entire career has been filled with satisfied clients who have experienced positive and productive technology based learning with me. I know the technology, the terminology, and the tricks of the trade. Most of all, I know how to share what I know with my clients in a positive, stress-free, learning environment. I am tech savvy with the ability to listen, demonstrate and explain what you are trying to do in words that everyday people can understand. I will help you with a follow-up plan of study and success. Individual and corporate training is available. I am currently presenting a series of workshops at Bluewater Health Hospital in Sarnia. Check out the Software Support link to see a list of applications with which I am familiar and can help you achieve technological success. I am available for one-on-one learning, corporate training, website design, and as a keynote speaker. I have been building websites and teaching how to build sites since 1995. The secret to building a useful website is teaching the owners of the site how to maintain it on their own, so there is no need to pay any monthly editing fees. Examples of sites can be seen at: St. Thomas Elgin Second Stage Housing , Alma College Alumnae, Icap London, Rock Your Career Club. It was a wonderful team experience at the St. Thomas Elgin General Hospital as it implemented HUGO throughout the hospital. HUGO is part of the Cerner® solution which enables physicians, nurses and other authorized users to share data and streamline processes across the entire organization. I developed and delivered training sessions to over 300 nurses. We all learned together and finished up the classes ready to move forward with the new technology. The photo shows me in my football jersey in "ready-to-go" position, just waiting for a nurse to call for help! It took 90 hours for me to convert this original paper-based publication to an e-book. It has been made available by an anonymous donor for everyone to download for free. It is a wonderful read. I can honestly tell you that because I have read it at least 10 times! 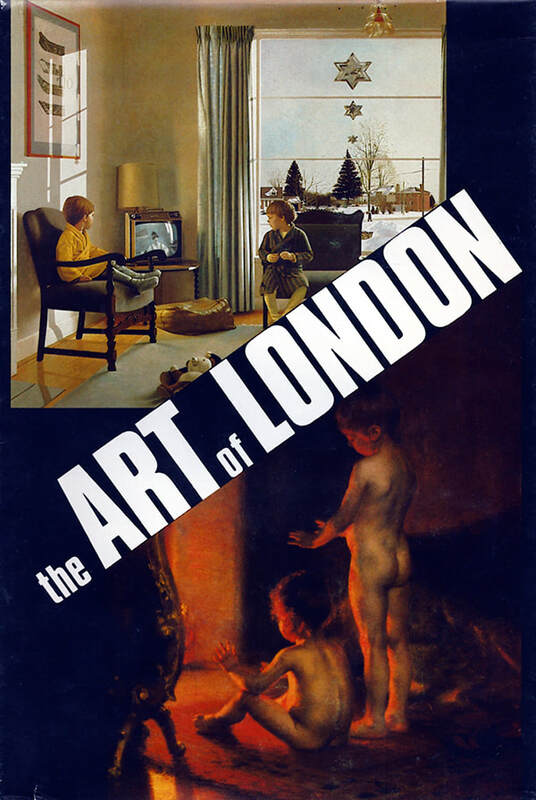 It is loaded with information and great stories about the progression of Art in London and our many artists. Please fill out the form below if you have any questions or comments about anything on this site.